Today's RTD: Should presidential electors exercise independent judgment? 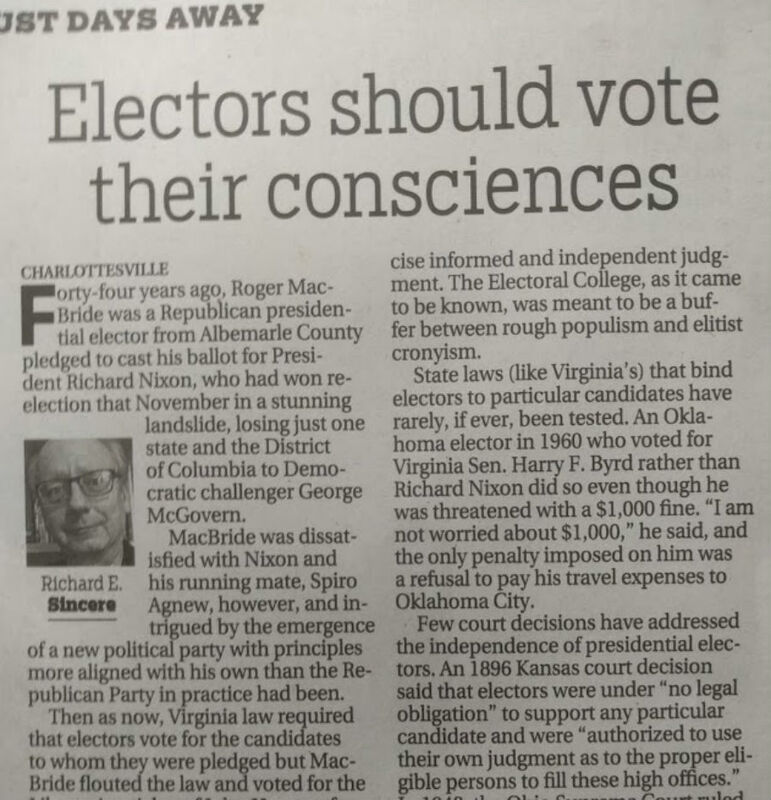 In the commentary section of today's Richmond Times-Dispatch, I argue that presidential electors can, and should, exercise independent judgment when they cast their states electoral votes in December. 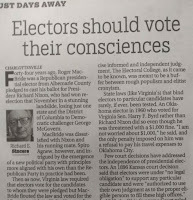 In "Electors should vote their consciences," I begin by telling the story of Roger MacBride, a Virginia elector in 1972 who was pledged to vote for incumbent Republican President Richard Nixon. MacBride chose, instead, to cast his ballots for the Libertarian ticket of John Hospers and Tonie Nathan. The Libertarian Party had been founded barely a year earlier, and its presidential ticket appeared on the ballots of only four states. (Nixon, you may recall, thumped George McGovern that year, winning every state but Massachusetts and the District of Columbia. He went on to resign in disgrace two years later.) The notoriety MacBride achieved by this brazen act catapulted him, four years later, to become the LP's second presidential nominee. State laws (like Virginia’s) that bind electors to particular candidates have rarely, if ever, been tested. An Oklahoma elector in 1960 who voted for Virginia Sen. Harry F. Byrd rather than Richard Nixon did so even though he was threatened with a $1,000 fine. “I am not worried about $1,000,” he said, and the only penalty imposed on him was a refusal to pay his travel expenses to Oklahoma City. Each elector can make up his or her mind about whether to follow the election returns or to vote independently, but this year's decision making process carries unusual moral and ethical weight. Both of the two largest parties have nominated flawed presidential candidates. While Democratic electors are, for the most part, satisfied with Hillary Clinton (if not enthusiastic about her) as their party's candidate, Republican electors are, like Republicans at large, conflicted about Donald J. Trump. The electors’ right to independent judgment may be most pertinent this year, when GOP presidential electors are expected to vote for a nominee who has brought shame to their party. The vulgar and impolitic Trump has expressed contempt for the Constitution, undermined confidence in the integrity of the electoral system, dismissed any interest in the legislative process, and been at loggerheads with time-tested conservative, Republican values. A Republican “faithless elector” in 2016 will bravely and astutely avoid the future taint of association with Trump, the most unfit character ever to seek the presidency, simply by casting his ballot for Gary Johnson (my choice, and the choice of this newspaper) or another suitable person. If either Democratic or Republican electors, in Virginia or elsewhere, choose to vote their consciences on December 19, I'll give them full credit for having moral courage. It would be nice to think my op/ed piece influenced their choices -- and perhaps some of them will have seen it, since (if the metrics app is believable) more than 3,700 readers have recommended the article to their friends on Facebook. Last night, in the third and final Democratic-Republican presidential debate, GOP candidate Donald J. Trump suggested that he may not accept the results of the election on November 8, continuing his theme of asserting that massive electoral fraud will take place and that is the only reason he will lose to Hillary Clinton. Today, Trump doubled down on his refusal to accept the central tenet of American democracy, that when a person or party loses an election, they become the loyal opposition and wait for another opportunity to win public office. Trump kicked off a rally Thursday in Delaware, Ohio, by saying that he "would like to promise and pledge to all of my voters and supports and to all of the people of the United States that I will totally accept the results of this great and historic presidential election." But he added: "If I win." “As a former Governor, who was elected and served as a Republican in an overwhelmingly Democratic state, I have to say that Donald Trump’s refusal to say he will accept the outcome of an election is just one more straw too many. It’s offensive to the thousands of election officials across the nation, and it’s offensive to a nation for which the integrity of elections is what sets us apart from much of the world. “Peaceful transition of power, which depends entirely upon honoring the results of elections, is as fundamental to our greatness and Constitution as anything else we do in America, and Donald Trump can’t even accept that fundamental without hedging. Johnson and his running mate, former Massachusetts Governor Bill Weld, have achieved ballot access in all 50 states plus the District of Columbia -- the first third-party presidential ticket to do so since Libertarian Harry Browne and his running mate, Jo Jorgensen, did it in 1996. This November 8th, if you decide to vote, you have a huge choice to make. You can either vote for a corrupt crony politician, or you can vote for a vulgar corrupt crony reality TV star. Because of the media, the partisan Commission on Presidential Debates, and the two major parties who have a vested interest in only having two parties, you would think those are your only choices. Well, you actually do have a choice at the ballot box this November. Gary Johnson, the Libertarian candidate, is on the ballot in all 50 states and D.C. He is an honest and a great man, not your typical crony politician or a bigoted, morally corrupt, gaudy salesman. Do I agree with Johnson on everything? No, but he is leaps and bounds better than Clinton or Trump and represents real change from the business as usual in Washington that has gotten us here. 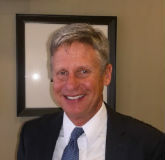 Is Gary Johnson perfect? No, but he actually admits that and it’s refreshing when a politician admits their humanity. Will you agree with him on everything? Probably not, but at least you know he does not have an agenda and he’s not speaking out of both sides of his mouth, or other orifice. The biggest smear the media can come up with for Johnson is his ‘Aleppo moment’, in which he didn’t know what Aleppo was when randomly asked during a live interview. Should he have been able to answer that question? Of course, he’s running for President, but it’s definitely not a disqualifier. I’d rather have someone whose foreign policy won’t cause Syrian and other middle eastern strife, than someone who would know, but only because she was part of the administration that caused the major humanitarian crisis. He had another moment where he couldn’t name a foreign leader he respected. A week later, he still can’t. The media would have you believe that he couldn’t name ANY foreign leader, but that’s untrue. He cannot name a current foreign leader he admires and he explained that he doesn’t want to defend them against things that he’s not even aware of. Again, this was an unscripted, live question. The other candidates NEVER have unscripted questions. They are screened, planted, and given well beforehand to prepare. So those are Gary Johnson’s big ‘scandals.’ Now, let’s compare those to Trump and Clinton. If I were to include all of them, this article would take up the whole newspaper, not 1600 words. Trump and Clinton are different sides of the same corrupt, crony coin. One sells her political power and influence and the other buys it. Trump is definitely no outsider, and Clinton is no progressive politician putting people before profits. Trump has a horrible temperament and would be a disaster diplomatically, saying whatever came to his head on a whim in public, completely alienating us and quite frankly being a national embarrassment. He has spoken about media organizations such as the Washington Post having issues if he becomes President because of stories they have written about him. He has spoken about companies such as Amazon (both owned by Jeff Bezos) getting taxed essentially out of business. His careless speech may even incite violence, with him making suggestions about gun owners taking care of Clinton and many other situations. Trump has exploited horrible eminent domain laws to obtain private land to build his developments. He scammed people with Trump University, used bankruptcy to screw people and contractors over while walking away with millions, and the list goes on. He’s a bigot, demonizing Mexicans and others. And he’s a misogynist, saying crude and horrible things to and about various women. That’s bad enough, but we have just found out that he sexually assaults women and brags about it in private. This latest revelation was caught via a hot mic. Some are defending him, saying that it’s ‘locker room’ talk. Of course men do that, just as women do the same. But, there is a HUGE difference between what Trump said and ‘locker room’ talk. Trump actually talked about how being famous and a star allows him to sexually assault women and get away with it. I could care less about the “lewd language”, I care about the actions he described and he gets away with. This is DISGUSTING. This is it, this is your moment of truth. Are you going to defend and vote for this loathsome egomaniac? I recommend voting against both evils and voting for Gary Johnson. 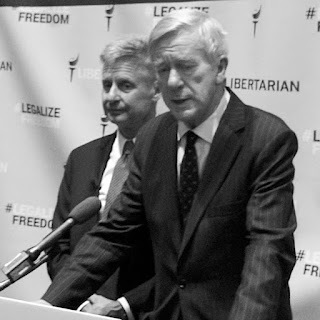 He is a two term Republican governor from a heavily Democratic state, as is his running mate Bill Weld. They will bring sanity and non-partisanship to the office, reaching across the aisle and working with coalitions of all parties. They are fiscally responsible and socially accepting, like the majority of Americans. They do not want to continue our failed foreign policy of drone strikes, invasions, backing various rebel groups, and overthrowing governments. They want to balance our budget and stop the growing $20 trillion deficit, which has doubled under Bush and then again under Obama. Reject both of the two major party Presidential candidates, the most hated in US history. The Democrats and Republicans believe they own your vote. They do not, you own your own vote. A vote for anyone is not a vote for someone else, like the narrative they are trying to play right now. Gary Johnson is polling roughly 10% nationally. But these are polls that do not include people under 40 (which actually favor Johnson) and/or have only Donald Trump and Hillary Clinton on the top line, head to head. In reality, they are not going head to head. This is at least a 3 way race in all 50 states, and a 4 way race in most states with Jill Stein. Johnson is polling over 19% in five states, over 15% in 15 states, and over 10% in 42 states. He currently is actually polling within margin or error to Trump in New Mexico. If Gary Johnson does get 10% in Virginia, then the Libertarian Party would get major party status and be able to run candidates within obtaining the ridiculous amount of signatures required currently. There are many other states where Johnson’s success would create more choice on the ballot as well. If he was allowed on the debate stage, run by the Commission on Presidential Debates which was founded by former Democrat and Republican national chairs, then I have no doubt that he would be even higher, and possibly overtake both candidates. But thanks to Ross Perot’s success, who was polling lower than Johnson and was allowed to debate, the CPD raised the arbitrary percentage to be in the debates. It’s a scam and even the League of Women Voters, who used to run the Presidential debates, dropped their sponsorship because they did not want to help “perpetuate a fraud on the American people.” Even dozens of major newspapers and publications are calling for Gary Johnson’s inclusion into the debate, with over 60% of polled Americans wishing for Johnson to be included. Gary Johnson has even received six major newspaper endorsements, to Trump’s zero. Will Hammer is a Libertarian who ran in 2014 for U.S. Congress and 2015 for Virginia House of Delegates. 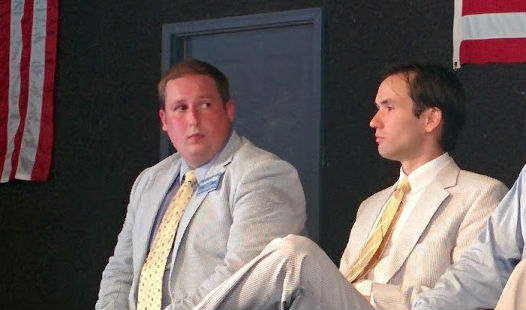 Hammer was the sole recipient of the Libertarian Party’s Patrick Henry award in 2016, which recognizes a very effective campaign for public office at the state or federal level, while communicating Libertarian ideas, principles, and values.